Because of this complexity, the notion of active reading is crucial. Readers have to consciously make sense of what they are reading and not just sit back and passively receive information. Successful comprehension requires readers to be able to think about their reading – an act of metacognition that leads readers to build connections, make inferences, synthesize, determine what is important, visualize, and generate questions. It goes to say that from a reading and cognitive processing standpoint, the more involved readers are with stories, the more likely it is that they will comprehend. I have noticed some very interesting trends in my research thus far. For one, many of my seven and eight-year-old participants – although they may already be familiar with The Three Little Pigs and Cinderella stories – often cite specific scenes or details in our discussions germane to the Nosy Crow eBooks. For instance, in Nosy Crow’s adaptation of Cinderella, the king sits behind a raised desk filling out invitations to the royal ball while his son, the prince, stands to the side playing paddle ball, idly watching his dad do all the work. 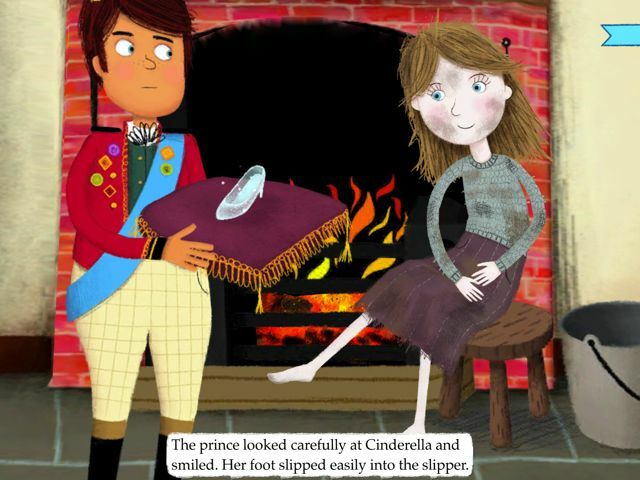 When probed to share his favorite part of the Cinderella story, one participant illustrated this exact scene, clearly linking to the multimedia embedded within this particular eBook. When asked to retell the story in her own words, another participant included acute details found in Nosy Crow’s version of The Three Little Pigs . She added information such as, “[The pigs] went to their mom and dad’s house. 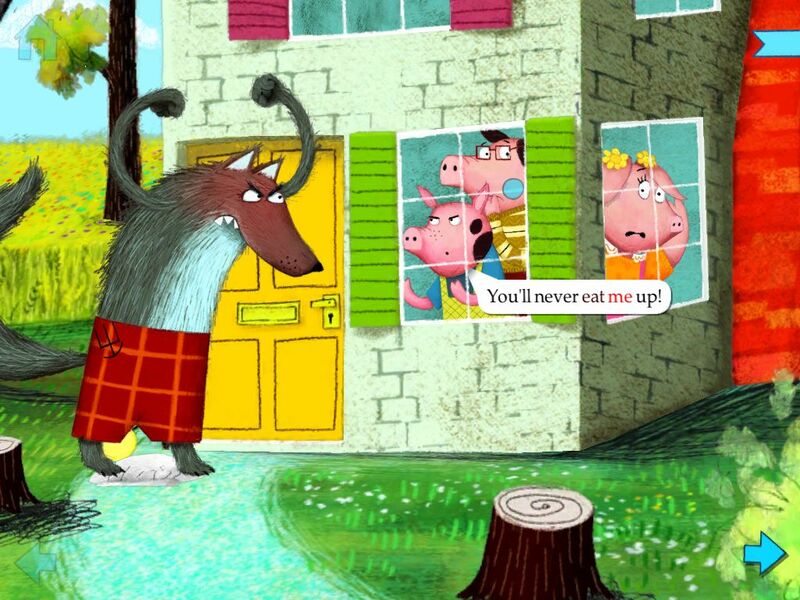 They told them not to go near the wolf and the wolf is behind the window and he said, ‘Don’t tell them I’m here.’” This critical scene shows that the wolf is eavesdropping on the little pigs, a point that is not explicitly stated in most retellings of The Three Little Pigs. Attentive readers can then draw a conclusion about how the wolf knows that the young pigs will soon be out on their own, thus, making them easy targets for lunch. Later, this same participant retold the end of the story and shared that “all the other pigs got brick houses,” (something that is not verbalized in the story’s narration but can be seen in the background on the last page). This scene allows readers to infer that the first two pigs learned some helpful life lessons and construction tips from their wise little brother. As part of my research, participants were invited to share a design feature that they favored or felt helped them to better understand the stories. What was one of the most popular responses? That fantastic speech bubble that appears when you tap on a character. Be still, my ethnographic heart! But there’s a potential downside to all of these bells and whistles. Past multimedia studies have shown that embedded interactive features could easily distract users and, ultimately, detract from meaning making. Thus, my study explores both the affordances and constraints of this new technology and how they may affect comprehension. For instance, a constraint that hindered one participant’s experience was one of the interactive games in the “Read-and-Play” mode of Cinderella. In this part of the eBook, the fairy godmother asks Cinderella to bring her specific items from the garden to magically prepare Cinderella for the royal ball. The interactive game requires the reader to use a finger to explore the garden and literally take control of the search. I silently observed as this particular participant spent about ten minutes searching the garden for all the items that the fairy godmother asked her to get, including three mice, a wheelbarrow, garden hose, pumpkin, and flowerpots. The participant dutifully moved around the extended screen with her finger, searching high and low for these items. Sometimes she would find the an item and drag it to the fairy godmother, only to not land in the right spot, sending the item automatically back to its original place. Adding insult to injury? The fairy godmother would ask for different items mid-search, breaking the student’s concentration (“Fetch me that watering hose.” “Bring me three mice.”). Research has shown that spending an extended time amount of time on interactive games could break a story’s narrative and interfere with the cohesiveness of a story, thus causing a breakdown in comprehension. When I later inquired as to why she spent so long on this task, the determined participant expressed her compulsion to help Cinderella find all of the garden items needed to transform Cinderella from dirty to flirty. She added, “…the fairy godmother wanted…everything to make Cinderella into a beautiful princess” and that she was doing everything because “the fairy godmother told me.” The participant went on to say that she got annoyed when she was looking for all of the requested items and wished she could have finished the task quicker. In essence, the multimodal nature of interactive eBooks has been brought into the educational spotlight, particularly since they require literacy skills that extend beyond those needed for static, print-only texts. Due to the relatively new development of interactive eBook applications, there is a shortage of empirical studies examining the pedagogical effects of this form of multimodal learning. It is still to be determined if interactive eBooks support readers in the area of comprehension. Consequently, there is a strong need for researchers AND designers to better understand how interactive eBooks could serve as cognitive tools to impact reading comprehension and knowledge building, and explore how particular features of an interactive eBook may serve as digital tools for higher-level literacy learning. It is my hope that my exploratory study will provide insight into how readers use interactive eBooks to make meaning in an increasingly multimodal world. Soon I will be moving into coding and analyzing my findings. Although other doctoral students may dread this part of the dissertation phase, I will not be looking for a magic wand to speed up the process. After all, who needs Cinderella’s fairy godmother when you have awesomely lovely and joyful data?